Rodrigo Santos, from Santos & Urrita Structural Engineers, had many great things to say during our last interview. Like any good discussion, Santos’ thoughts generated many other more technical questions that readers brought up. I returned to get his thoughts at 5:30 a.m. on a recent weekday, which was late since he begins his work day at 5:15 am. Here are some questions, answers and links. ML: What is the soft-story ordinance and why is it directed at one class of structures in the city? Santos: The soft-story legislation applies to wood-framed structures built before 1979 with five or more residential units and three or more stories in height that appear to have a weakness in the lower floors. These buildings were selected primarily because structural engineering studies and our experience indicate that these buildings are more susceptible to seismic damage. Additionally, multi-residential buildings are a focus, as these upgrades will have a larger benefit for protecting life in the city. This is an ongoing effort to improve the safety of the city for all. ML: What is a shearwall? Santos: A shearwall can be made of the standard structural materials: wood, concrete, or steel. A shearwall is a stiffened wall that is usually vertically continuous from the foundation to the top of the building, or extending vertically as much as needed. Santos: Adding shearwalls will help the building resist damage from seismic ground-shaking movement. Additionally, there are vertical ties at the ends of the wall to keep the wall from tipping over or separating from the foundation. A wood shearwall is a wood stud wall covered or sheathed with plywood and steel ties and bolts that connect it to the foundation. Structural plywood was introduced in 1948 in the U.S., and prior to that diagonal bracing was placed in walls to create lateral strength. Diagonal bracing is still used in some cases for an alternative to a shearwall or when adding sheathing isn’t desirable. ML: Why are unreinforced masonry or brick foundations undesirable? Santos: Brick foundations are brittle. Any time there is seismic activity they tend to crack, separate and lose their structural integrity. They have limited capacity to span. In the event of liquefaction, when the soil beneath the foundation weakens or falls away, brick cannot span the unsupported area. We always recommend that brick foundations be replaced with properly engineered and reinforced concrete. In certain locations, a soils engineer should be employed to give advice and direction as to proper foundation design. ML: What is soil liquefaction? Santos: Needless to say, this is a complex and technical subject. Basically liquefaction is when the mix of soil and water reach the consistency of quicksand and occurs in saturated soils. Water arises with a seismic event and the soil loses all of its bearing capacity and the structure is no longer properly supported. ML: How much more expensive is it to engineer a building in San Francisco than anywhere else in the Bay Area? Remove the potential for delays and expenses caused by opposition, appeals, etc. Just address the cost for engineering and construction that might be unique to San Francisco. Santos: It will be more expensive for several reasons. First, properties in San Francisco are often built to property line and there are no gaps between buildings. So, when engineering one building, the design needs to carefully consider the structure of surrounding buildings as well. This closeness triggers the need for a different design and soil engineering methodology so that adjacent buildings aren’t affected. The consistency and nature of the soils in San Francisco varies dramatically within the city. The city has soil conditions that range from the highly liquefiable sands in the bay mud to areas with solid rock. There is even variation within a single lot. So a soil report is always necessary in new construction and major renovation and brings additional costs. Of course the rules and regulations from the San Francisco Department of Building Inspection are conservative, which adds to the construction requirements and hence engineering costs. These details also insure a safer city. ML: What percentage of San Francisco buildings are wood-frame structures? Santos: Most all of San Francisco’s buildings are wood-frame. Pretty much anything less than 40 feet tall will most probably be wood-frame. After the 1906 earthquake and the reconstruction of San Francisco and areas like the Mission, the majority of the construction was timber-frame. However, the city chose to rebuild the Tenderloin with a higher density in mind. So those buildings were concrete (or steel) and taller than what existed before. After the earthquake of 1906 the city designated the Tenderloin to have buildings 65 feet or taller. That is approximately seven stories. It is interesting to find that the highest population density and the highest percentage of concrete buildings are in the Tenderloin. That area has greater vertical projection than other areas in the city. ML: What is the practical height limitation to wood frame buildings? Santos: The city allows buildings up to 50 feet in height to utilize wood-frame design. So that is limited to four stories of timber over a concrete podium. We have done many buildings with this configuration. A height much beyond that and you are asking the wood to do more than its physical capabilities permit. Also, the structural quality of wood has declined over time. The old growth timber that was predominately used following the earthquake was considerably stronger than the timber we use today. The structure of taller buildings today are generally concrete and steel, but wood is often used for internal non-structural elements. ML: Two terms are frequently used to describe construction of wood-frame structures. One is Platform Construction and the other is Balloon Framing. Would you explain the difference? Santos: Balloon framing is where studs in a wall extend two or three stories and has ledgers on which the floor joists are placed. Platform framing is where one floor is built on top of the other and studs are not continuous but break at each floor above and below the floor joists. For many reasons, platform framing is the dominant type of wood-frame construction used now. Balloon framing was used in the late 1800s up to the 1920s. So if you look at an old building, built prior to 1928, it will be most probably balloon framing. Obviously, it is a lot more efficient and cheaper to use platform construction now. It is also difficult to find timber of that length now. Every couple of years the building codes are updated. What we have learned is that the strength of the wood we get today is much weaker than that which was available in the 1800s. The old-growth timber was dense and strong. In the 1970s you could get solid wood floor joists that would span a standard San Francisco lot of 25 feet with a 2 x 14 framing member. If you were to use the same dimension of lumber today you would have the flexibility of a diving board. The old-growth lumber was much stronger and dimensionally stable. Engineers often overcome that problem of reduced strength lumber by using what is referred to as engineered lumber. This material is called by many names, engineered wood products, Truss Joists, Microlams, Minilams, Glulams, and Oriented-strand Board (OSB). They are a hybrid of natural wood, recycled wood and resins, all combined in a manner that guarantees that the element doesn’t shrink, is strong, and doesn’t deform. Engineered lumber is often identified by what appears to be flakes, chips, or layers of wood put together rather than a straight, continuous grain. ML: What are the issues around brick chimneys? Santos: My suggestion to clients who ask me for a structural inspection of their house is to remove and replace their brick chimney. Replace them with a light sheet metal system or stud framing around proper metal flue designed to be architecturally compatible with the period of their building. Granted this modification might be costly, but will remove the hazard of bricks falling during an earthquake and will reduce seismic loading on the building. ML: What are the challenges presented by a first floor of a building being almost totally dedicated to parking? Santos: There are basically two different situations to consider: new construction and existing buildings. With new construction, typically you will create a platform. This is a very stiff concrete box (concrete walls and floor) on top of which the floors above will be constructed. Due to this layout, the first floor interior can be open because the concrete has strength and is rigid. In older or existing construction, where you don’t have a rigid concrete box, structural steel frames or some other system should be used to prevent the sway of open area. There are several options there. Both solutions can be costly. ML: In new buildings we see big windows, floor to ceiling. How can that be done and maintain integrity in a seismic event? ML: I have heard the safest place to be during an earthquake is in a doorway. Is that accurate or better-said where the safest place to be during an earthquake is? Santos: That is probably true. A doorway is framed with headers and multiple studs and provides something to hold on to. But really the safest place to be is really directed by soil conditions. The stability of the soil varies around the city. The best might be in a new building in Diamond Heights. The USGA has several publicly available seismic maps of the city. They indicate where the areas of greatest risk and safety are located. During the 1989 earthquake there was almost no damage in Diamond Heights and parts of Bernal Heights. Actually, many of the people living in those areas were unaware that there had been an earthquake. So as we look at different areas and construction, risk can vary a lot. For example a well-designed and constructed building in the south of Market area will be safe, whereas an older building with outdated design in the same area runs considerable risk of damage in a seismic event. The soil conditions are critical to seismic performance. Can those risks be overcome with current design technology? As we look at the newest high-rise buildings in San Francisco, they are mostly built on soil, that is notorious. They are very safe buildings because they are built on piling secured foundation systems that are specifically designed to withstand significant seismic events. Particular methods include pilings, piers, mats, pressure grouting and chemical grouting, all of which serves to consolidate the otherwise unstable soil. ML: What are the emerging opportunities for engineering and structural design improvement? Santos: The greatest opportunities are to implement modern technologies to more buildings. The first move in that direction was the ordinance to strengthen parapets in the city. It was called the High-Rise Ordinance or Parapet Ordinance, which was passed in 1983. Every tall building with a parapet needed to be braced to withstand an earthquake. That needed to be complete within five years. The objective was to prevent the parapet from detaching and falling onto the street during an earthquake. (Note: all the work was complete before the 1989 earthquake). Ordinances that require major structural modifications are ideally timed with the economic cycle. If the property owner is asked to make a major expenditure, ideally it will be at a time when they can get financing to comply. The next example of retrofit ordinance came from our understanding of existing structures and their performance during a seismic event, the 1990 UMB (Unreinforced Masonry Building). Every brick building in San Francisco needed to be upgraded. There were many levels of importance assigned to specific buildings. Property owners were given 10 years to implement that ordinance. During that period over 1,100 buildings were upgraded. Again the majority of those buildings were built during the boom of the 1840s and 1850s. People came from back east and used their structural designs and materials, which didn’t accommodate San Francisco’s seismic challenges. Obviously, earthquakes didn’t occur in Boston and New York, as is common in our region. Most recently we have enacted the “Soft Story Legislation” AB094. Around 6,000 buildings in the city will be affected by AB094. Most probably the next step, following the soft-story ordinance, will be to improve marginally reinforced concrete buildings. The greatest concentrations of these buildings were built right after the 1906 earthquake and fire. They are predominantly in the Tenderloin District. They represent the next test for a structural engineer. The challenge will be determining which buildings need improvement and what are the best technologies to be used? How do we effectively accomplish our structural objectives without displacing too many residents? Those are the things that are being considered now. There are over a thousand large, very densely populated buildings to be reviewed. Obviously these improvements need to be accomplished without altering the architectural and historical nature of these buildings. This last group of buildings to be considered is only in the discussion phase. No legislation has been drafted yet. ML: Does bolting the plate to a brick foundation increase seismic performance? 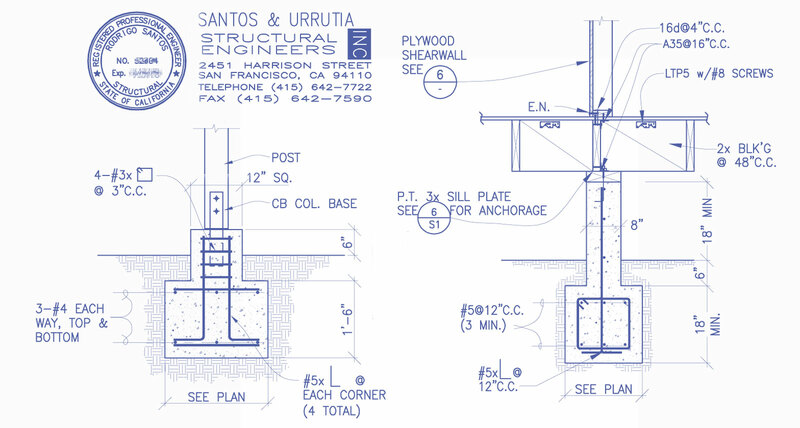 Santos: Sill anchoring to a brick foundation is not recommended. ,When sill anchors are drilled and epoxy grouted, the brick will be fractured and will lose structural integrity. The purpose of anchoring is lost and the brick foundation is weakened. You can strap to the foundation and bring the strap to the face of the studs. There are things that can be done. But the safest and most prudent way to deal with a brick foundation is to take it out. ML: Is there anything from a structure standpoint that saves water? Is there legislation addressing any of these opportunities? Santos: It is interesting that the SFPUC has introduced a series of guidelines in regards to grey water and drainage systems and the collection of water. Previously, they were a quiet utility now they are pressing for some very worthy changes. The SFPUC direction has two benefits. First, it insures that all the water, be it grey water or collected rainwater is best used. Second, the San Francisco waste water processing systems combines sewage and rain runoff. Better capture and use of grey/run-off water reduces the demand on San Francisco’s sewage processing system. The design of new buildings, in terms of meeting these new guidelines, is quite challenging. New construction requires systems that can capture and recycle rain runoff and to some extent, grey water. For example, 345 Brannan, the new home of DropBox, has a sophisticated water collection and recycling system. Now new construction has another entity from which their designs must gain review and approval. SFPUC will actually have a stop in the plan approval chain at the Department of Building Inspection. Once again San Francisco is way ahead of other communities when it comes to implementing bold new ideas. ML: What is Title 24? Santos: Title 24 is the definition of the energy efficiency required for new construction and significant remodels. It is part of a mechanical engineering review that guarantees minimum energy efficiency design specifications are met. It includes things like insulation, window design, even lighting. Title 24 is included in the current building codes. Again, it is a set of mechanical engineering specifications, which are updated regularly, as technology evolves. ML: Are there codes relative to sound transmission? Santos: As we learn, the codes evolve. Sometimes those lessons come from things like litigation. In other words, designs are often improved upon to avoid litigation subsequent to project completion. This is particularly true when it comes to things like sound insulation. In many cases, the city will require a sound study depending upon the location of the building. Sound transmission becomes crucial in things like condominiums. These are elements the residents and builders don’t appreciate until the building has been occupied. Obviously, remediating sound at that point is very difficult and quite costly. Therefore, designers and builders tend to over-engineer in the area of sound transmission. Finally, a wonderful resource on the geographic evolution of the Mission District is provided by a 75-minute podcast that traces the geography and building of the Mission from the 1700s. This is a very scholarly presentation. Here is the “Trailer”. The podcast is, to my knowledge, provided at no cost. I agree. More in-depth, well-researched articles like this are to be encouraged. Very informative article and a good interview! To clarify a little regarding Title 24: the California Code of Regulations comprises 28 titles. Title 24 is the Building Standards Code, which includes energy regulations referred to above, but also is the guideline for structural safety, accessibility, and fire/life-safety. Title 24 has 12 parts (Building, Electrical, Mechanical, Plumbing, Energy, Fire, Green Building Standards, etc.). To answer the last question in the interview, yes, there are both state and local codes dealing with sound transmission. In Part 2, Vol. 1, Section 1207, the sound transmission of Interior Environments is addressed, albeit for only about five paragraphs. From James Dunbar via e-mail. Agree that this is such a concise Q&A that goes to so very many client questions I get from buyers and sellers of property. (spoiler alert) Who knew Diamond Heights folks didn’t know there was ever an earthquake!